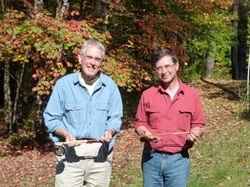 Bamboo Fly Rod Making Workshops - Learn to Build Your Own! We use The Morgan Handmill for our workshops. This is the most accurate device for tapering strips of bamboo. With over 18 years of experience using the Handmill, you will be learning from one of the most experienced instructors anywhere. One of our students came from South Africa to learn how to properly use the Morgan Handmill which he had just purchased. Another satisfied student with his finished 7’9” Parabolic rod! Located in the historic Town of Kittery Point, Maine, our shop is situated only 300’ from salt water. Listen to the sounds of fog horns and lobster boats as you craft your own personal bamboo fly rod. Our classes are truly unique by offering one-on-one (or two-to-one) instructional classes eliminating the congestion associated with other venues. Spouses may enjoy shopping at the local Kittery Outlet Malls or across the river in the historic seaport town of Portsmouth, New Hampshire. Accommodations may be found in local B&B’s and hotels. Contact us for help in locating a place to stay. These classes are generally scheduled for one week, Monday through Friday, with Saturday as an optional day if needed so that you will leave with a fully-completed rod, ready to fish. Some students may not be able to take a full week of vacation, so an alternative schedule might include a day or two here and there (adding up to 5 days). Students will craft their own bamboo rod under the direction of master rod-maker, Fred Kretchman, with all the materials and equipment supplied by The F. D. Kretchman Rod Co. We use the Morgan Handmill (developed by the late Tom Morgan) for tapering the strips. This Handmill is the most accurate devise available today and virtually eliminates “open glue seams” that are common with other methods such as hand planing. Fees for this class start at $1900 for a classic grade, 2-piece, 1-tip rod. Additional features can be added for an extra cost. Classes can be scheduled throughout the year, so contact us to discuss possible dates. Lunches are provided and may be enjoyed overlooking our local harbor and private town beach! Students will flame bamboo, split it into strips, taper & glue them, straighten the sections, mount ferrules, and apply guides, reel seat, cork handle, and varnish. We only use the finest quality nickel silver components, snake guides, and pure silk thread. The end result is that you will make a quality rod that you’ll be proud to own, fish, show to friends, and pass down to the next generation. Remember, the emphasis in our class is to fully complete a high quality rod; not a fast/cheap substitute! 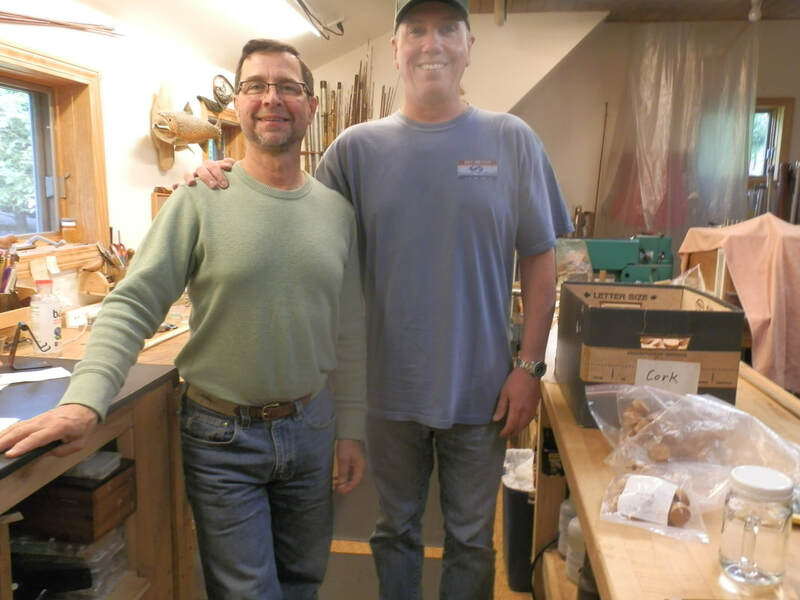 I had the opportunity to work with Fred Kretchman from October 15 to 19, 2018 in one of his Bamboo Rod Building workshops. I had researched working with several rod builders and decided that I wanted to work with Fred. After contacting him regarding when he had the time to work with me, he responded quickly, and was very informative regarding his class, reading that I might do beforehand and details regarding this experience. He and his wife Bonnie were able to suggest accommodations, which were a success, as well as inquiring as to any dietary preferences. Lunches were provided each day, curtesy of Bonnie, who is an outstanding cook. Fred explained and broke down each stage of the design, construction and finish of bamboo rod. He was able to show samples of his work as well as the work of other master rod builders to me, which made it easy to settle on what I wanted to try to build. Fred is both an outstanding craftsman and teacher. Fred explains each process, demonstrates each task and then had me perform the task. He is attentive and focused on the student, but is not overbearing. Fred very patiently taught me the various special skills needed to work with bamboo, and to craft a rod. During this instruction, Fred was able to teach me some of the history of rod making and relate a great deal of information about rods, and rod makers. The days of working in the shop moved along quickly, but I never felt rushed to complete a task. The experience of taking bamboo in its raw form and then gradually transforming it into a working rod, is quite amazing. Fred made this process both understandable and very enjoyable. I am extremely pleased with the 6’6”, 3 -weight rod that I built with Fred. The rod turned out far better than my expectations, largely due to the care and attention given to this project given by Fred. I am looking forward to fishing with it and passing it on when I can no longer use it. This whole experience was a positive due to Fred’s craftsmanship, professionalism and ability to teach. I would endorse this workshop to anyone who has an interest in handcrafting their own bamboo flyrod, as well as learning much of the history or these iconic implements. In sum, it was an unforgettable experience for me. The week could not have been a better 70th birthday present to myself. Thanks for the memories. Here are a few of my "students"
Samantha was a delightful student. She crafted a fly rod for her father's 50th birthday.... a gift he'll never forget. Ray (a retired machinist and shop owner) is crafting his first rod and working with bamboo for a change. He's become a very good friend and loves to tell folks about his experiences making and fishing his rod. A talented jewelry maker and leather worker, Hannah, crafted a gorgeous fly rod for her husband in celebration of their wedding anniversary. Walt is making his own special rod. Here he is removing the dams inside the bamboo. A delightful couple who were so fun and a joy to have around- and he made a beautiful rod. The above photo is of myself with noted flyfisher/author/guide from South Africa: Dean Riphagen. What a great time we had together. The duration of a class is usually Monday through Friday, but can be arranged to accommodate a busy work schedule. Saturday is an optional day, if needed, so that you will leave with a fully-completed rod, ready to fish. Classes are scheduled throughout the year, so contact us to discuss possible dates. Fees for this class are $1900.